I love the Fall. Ralph is all enthused about the colors. I need to get outside with my camera to get some photos before it all goes away. But in the meantime…let’s do Fall foods. My foods don’t really seem Fall-ish to me. Haven’t started soups yet. I need to get on that. But we always have What I Ate Wednesday, the crazy good link up started by Jenn at Peas & Crayons. Don’t forget to check it out when you finish here! My food is a little all over the place this week, so try to stick with me. Filled with my go to breakfast of bran flakes, Fiber One and vanilla soy milk. This is my first time trying vanilla soy milk. Doesn’t taste that different from plain. Tasty nonetheless! 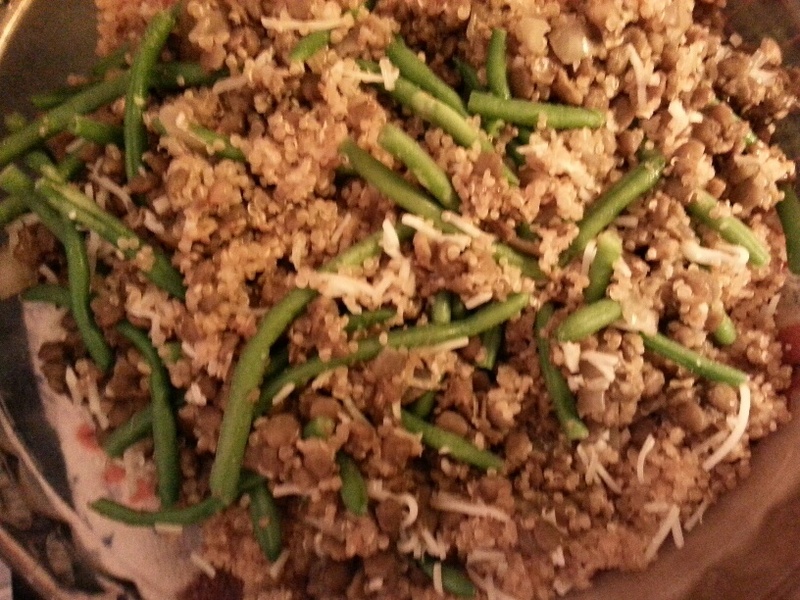 One of my crazy one dish meals of crock pot lentils, quinoa and green beans topped with Romano cheese. Actually photographed on my lap while I sat on the bed watching TV. Too much info? It was delicious…that’s the info you need! 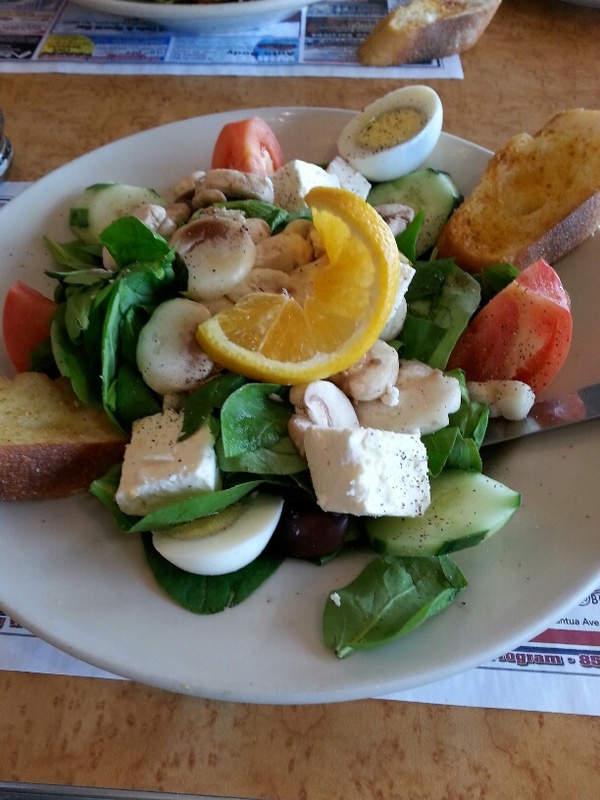 A tasty spinach, feta, egg and various veggie salad at a diner we don’t often go to. I really enjoyed this. 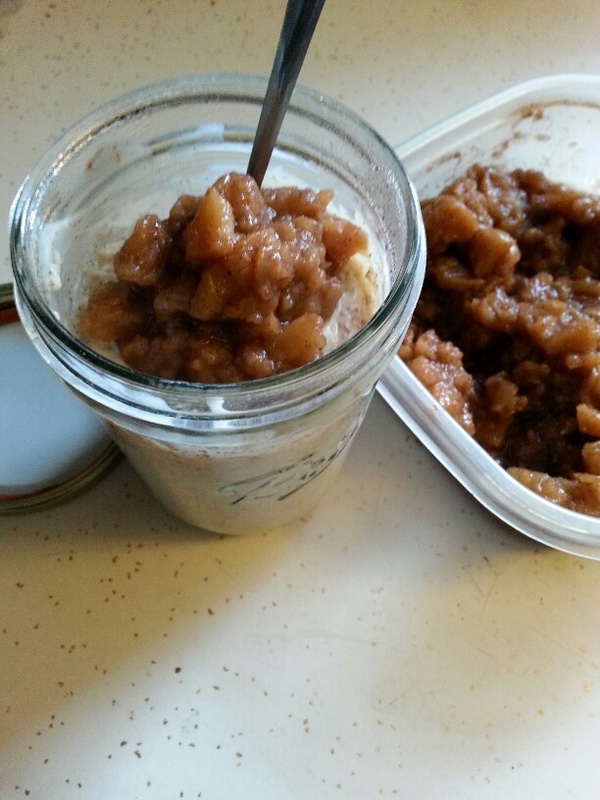 Overnight oats topped with crock pot apples. A half cup of oats, third of a cup of fat-free vanilla yogurt, half cup of vanilla soy milk and lots of cinnamon. I like to heat mine in the microwave. One minute, then put the apples on top and another 30 seconds. Perfect for me! Need to make more crock pot apples. I always finish them off too quickly! Last but not least is breakfast at one of our favorite diners after Ralph’s doctor’s appointment. 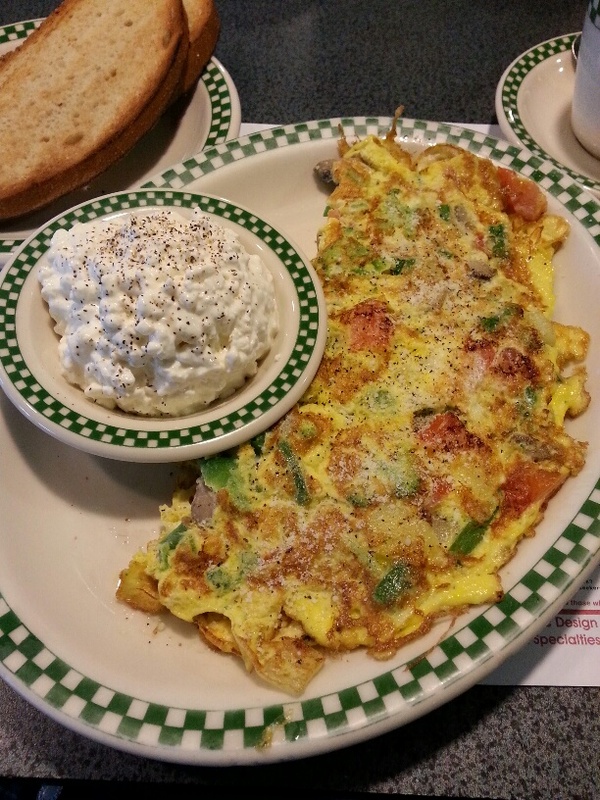 Tomatoes, green peppers, onions, mushrooms and asparagus omelette. So good. A side of cottage cheese…a flashback to last week! That’s WIAW for me for this week. I do hope to do some more actual cooking in the coming week. I NEED soup. Be sure to check out what everybody else has on their plate over at Peas & Crayons. You’re sure to find something you like! Happy What I Ate Wednesday!! This entry was posted in Uncategorized and tagged crock pot, oatmeal, sorting and packing, WIAW. Bookmark the permalink. Cute mug and bowl Fran! 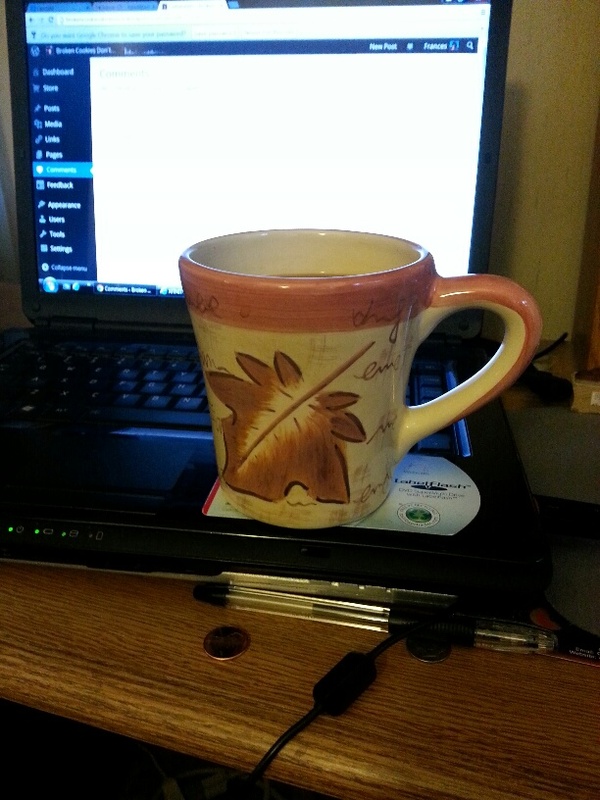 I need to get out some of our seasonal mugs (mostly Christmas-themed, but close enough, right? 😉 ). Yum. I love crock pot apples and I bet they would be amazing topped on your oats. Thanks, Madison. The apples are so simple and SO delicious. Totally worth the effort although there never seem to be enough! Have a great WIAW!! You do need soup, especially since soup seems to be all I eat these days and I love it. 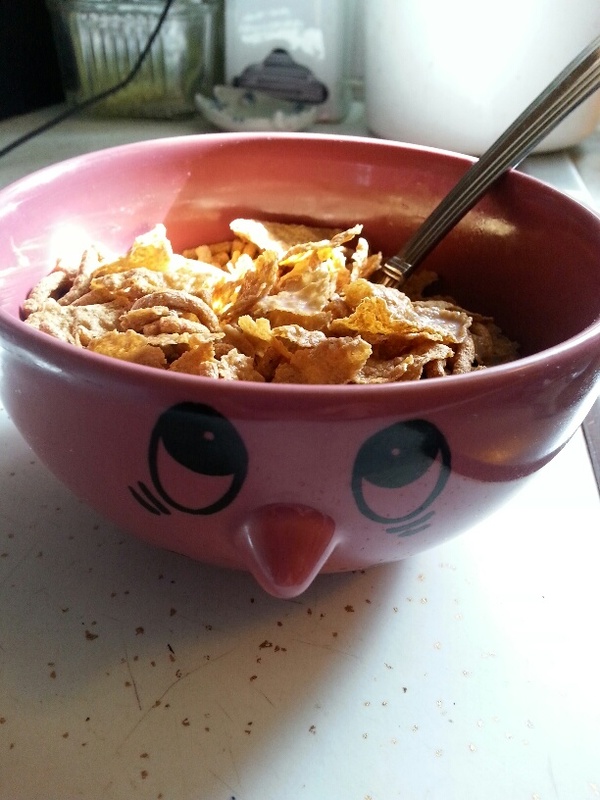 You could even eat it out of that cute bird bowl. The salad looks delicious and good for you eating your veggie and quinoa concoction where ever you please. My dinner, especially now that I’m flying solo during the week, is usually eaten on the couch while I catch up on a t.v. show.